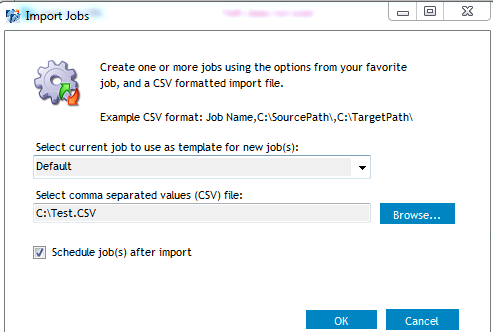 How to import a job from a CSV file. IMPORTANT: Do not put a space after the comma. Within the Secure Copy console, choose File | Import. In the Select current job box, select a copy job with the options you want to use. In the Select comma separated values (CSV) file box, click Browse, and choose the file to use. If you want to schedule the jobs after the import is complete, select the check box.